The storm passed through last night, woke us at 6am, but otherwise no damage here. 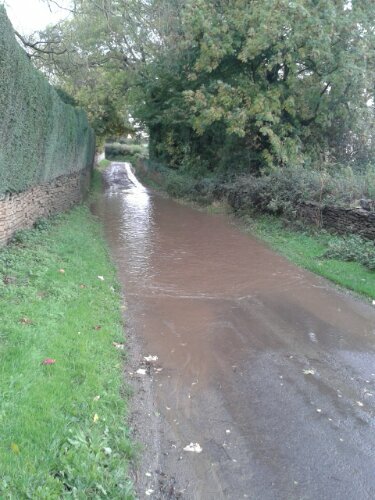 Decided I’d better get out for a run, and I chose a route without trees (just in case). Since I have a 10K in 3 weeks, and another in 4 weeks time (good planning, eh?) I thought I’d better try some speed work. 1. Intervals run into the wind and rain are Hard Work. 3. 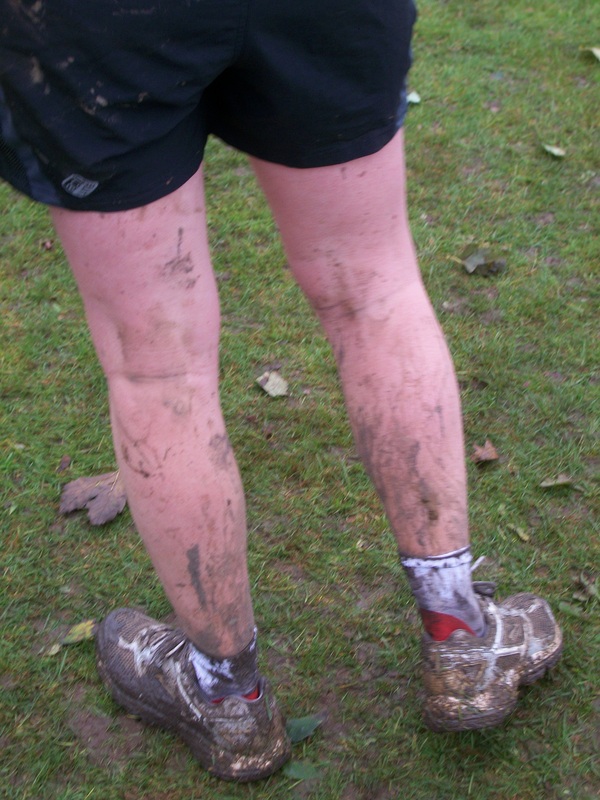 Running intervals after running through those two puddles sounds like this (400m fast bit) “squelch squelch squelch squelch squelch squelch” (then 90 seconds recovery) “squeeelch squeeelch squeeelch squeeelch squeeelch”. So after last Sunday’s mud and bull filled Marshfield Mudlark, I’d been presuming that this weekend’s half marathon would be a straightforward road race. Starting and finishing in the small Wiltshire market town of Devizes, the route quickly heads out into the surrounding countryside. The elevation profile showed 4 hills, rave reports from last year had moaned about the hills, but after my extensive hill training for Marshfield (cough cough) I thought I’d be okay. Race day dawned grey and damp. I was thankful to wake up from a dream about the race where I got lost in the town centre, so decided to pop into some public toilets, and when I came out the town was deserted, with no marshals or signs to be seen anywhere. Hoping it wasn’t a prophetic dream I set off in good time, managed to park just across the road from the start area and joined a very short queue for the portaloos. All was looking good so far. I managed to meet up with two online friends from Runner’s World (that I’ve met a couple of times before), and we shivered and chatted before we were summoned to the start line, half an hour before the race started. This was the perfect time for the heavens to open and the rain to start falling. My friends were both aiming for sub 2 hours, whereas I was hoping to get somewhere close to my Chippenham time of 2:13:35, so I was aware that as we got closer to the start time I’d need to shuffle backwards. We couldn’t hear any of the pre-race briefing, we couldn’t see the Mayor who was supposed to be starting the race, but we did suddenly hear an air horn and felt everyone start moving forwards. Whoops – no time to head for the back, I just had to start running. We crossed the start line – surprisingly with no chip timing mat – started our Garmins, and we were off. My friends disappeared off and I struggled to stick to my 10 minutes per mile planned pace. Runners streamed past me, as I was that annoying person who gets in the way by starting too far forward. As I’m used to starting at the back this was a depressing experience that I won’t be repeating. I was aware I was going off too fast, but decided the first hill would slow me down. 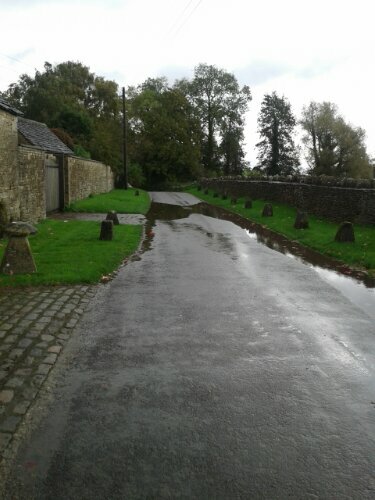 The rain carried on falling as we headed out of Devizes on a main road. We headed up the hill, which wasn’t as steep as I’d thought it would be, but it did carry on around a corner which was too much for some people who started walking. The wind and rain was battering down on us now, but at least climbing the hill helped warm me up. The rest of the race went swimmingly (sorry). I had a gel at four miles, just before the water stop, and planned to have another at mile 10. I only usually take one gel in a race but thought I’d try two and see if it helped with my stamina towards the end of the race. The next couple of hills were okay, I was soaked to the skin and my legs were feeling stiff. I really wasn’t feeling the love for running at this point, but knew the only way to keep warm was to carry on running. The Mile 7 ‘Heart FM Cheer Point’ did make me smile. It was in a farmyard, with a Heart FM car with the radio turned up, a man with cups of water and a lady with a large foam hand and a tray of jelly babies. Very Wiltshire! Eventually I reached mile 10 and took my second gel. Only a 5k to go. Mile 11 – less than one of my ‘short’ runs. One more water station, a sharp turn off the road onto a gravelly track and the last hill. Oh boy -they saved the best till last! This was a steep hill, made worse by the fact it now had a stream running down it making it slippy and very loose underfoot. I started off running but when the lady just in front of me started walking then of course my legs automatically started walking as well. At least there was a steep downhill on the otherside which gave me the impetus to carry on to the finish. As I came back onto the field, which we had to run around to get to the finish line, suddenly I heard shouting and clapping. My friends had waited and were cheering me over the line. It gave me enough of a mental push to put in a sprint finish. I crossed the line, according to my Garmin, in 2:13:05, another PB by 30 seconds. Although I was pleased that my friends had waited in the rain for me, I was even more impressed with the marshals who stood out there, in the rain, for hours and hours. They were all smiling and encouraging, and they made a huge difference. Thank you, Marshals, and thank you Devizes. 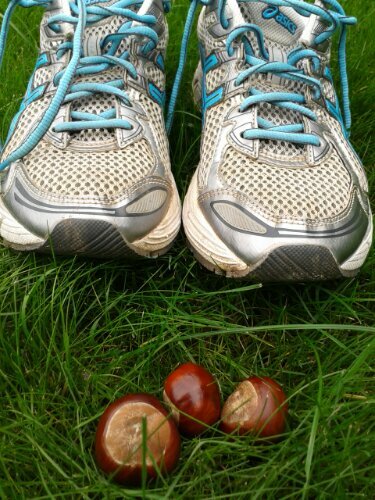 I may well be back next year… as long as my trainers have dried out. Sunday 13th October 2013 dawned cold and wet. Perfect weather for the first Cross Country race of the year, I thought, as I sprang out of bed early on Sunday morning. Okay, I didn’t actually spring, call it artistic license but it sounds better than ‘crawled’. 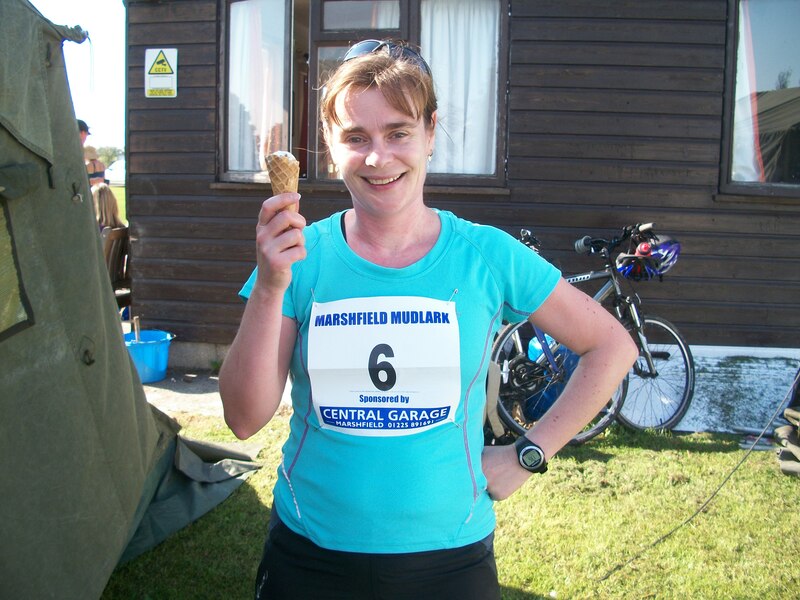 I first ran the Marshfield Mudlark in 2010, with an ever willing friend, when it was muddy-to-the-knees weather. We slipped and splashed and chatted our way around. I was introduced to ‘The Hill’ (it rises 100m in a kilometre) and we braved a field full of horses together. Undaunted, I ran it again in 2011, on my own this time. To prove how capricious the British weather can be, it was sunny and hot. I still managed to find some mud (that would be the small stream the route crosses), but I was more interested in the excellent Marshfield Farm Ice Cream at the finish line. I didn’t run this race in 2012 (can’t remember why, but I gather it was a mudbath), so decided I’d run it again this year. We had been warned that if the weather was bad we might not be able to park on the cricket field, so I arrived early so I could park close by on the road if need be. I was fairly surprised as I was ushered onto the field to park – and was hoping they had a tractor on standby to pull us all out if the rain continued. 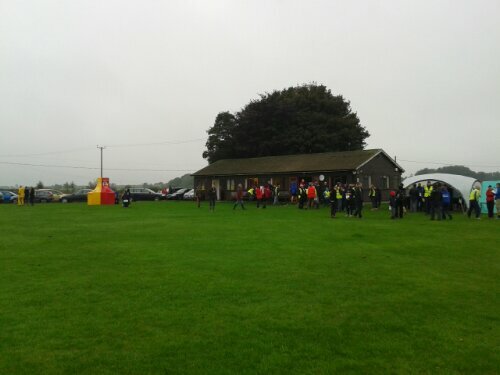 Braving the weather I headed over to the cricket pavilion (“race HQ”) to see what was happening. The place was full of parents eating bacon butties and kids wearing ‘Mini Mudlark’ numbers who were scoffing cakes. I popped into the Ladies as there was no queue, removed my warm jogging bottoms and then headed back to the car. My legs felt cold and I was determined to keep my fleece jacket on for a long as possible. Eventually I removed my jacket and went for a short warm up jog around the field. In a strange sadistic way I was pleased to see every other racer looked as cold as I felt. We were called for the pre-race briefing at 10:15 which was a light hearted affair, until the race director mentioned that most farmers had been extremely helpful about moving livestock out of fields that our route ran through. Pausing for a ripple of nervous laughter he then mentioned a field of ‘male cows’ that we should be careful of. I could see some people glancing down at red tops and swallowing hard. Before we could worry too much we were sent onto the road to line up for the start. Confusingly you have to go over the line, turn around and then line up. This is fine, but does mean there is a fair bit of shuffling, as faster runners hog the start line as slower runners shuffle past them heading towards the back. I was still squeezing through when the race started. As we were so squashed together it took a few moments before I could move. Then I was running forward, desperately rubbing my hands together and wishing I had worn gloves. We ran past the cricket club and turned sharply off to the left. Down a gentle hill and then we took a right turn onto a footpath. This path slopes gently down under some trees, with misty views of the valley to the left. As the path takes a sharp left turn I could see runners picking their way along the valley, splashes of colour against the mist. I had another one of those emotional moments when I can’t quite believe what I’m doing, but had a good sniff and just carried on. Running along the side of the valley along a slippy grass path was tough on my ankles. Suddenly I felt my legs slip from underneath me, and I threw my arm out to break my fall. My legs were spinning like a cartoon character running over a cliff and amazingly I regained my balance and didn’t hit the mud. Panting from the adrenaline now surging through my veins, the course continued, misty, hilly, muddy and slippy. We slithered down slopes, clambered over stiles, and then staggered back up again. For the first time running this race I had to queue at some of the stiles. I was hoping this was because I was keeping up with runners this time, but frustrated that just as I was catching up with the lady in front of me I’d have to wait whilst she climbed over and then shed pull away from me again. I managed to sneak past her at the first water stop in a sneaky ‘just take one gulp’ manoeuvre. As I ran through the field that had housed a bull last time, I peered about to make sure the field was as empty as it looked. It was. Maybe I’d managed to sneak past the bulls without even noticing them! As we came out of the field we turned sharply left and I recognised that we were at the bottom of The Hill. I tried to run up it, but it’s just too steep and I knew there were plenty more hills still to come. I could see a girl in front of me who did manage to run the whole way. By the top I had nearly caught up with her (she was doing my classic slow-running technique) but kudos to her anyway. And even more kudos to her friend who had sped off ahead of her, made it to the top of the hill, and then turned and ran partway back down to run up again with her. I caught up with the couple in front of me just as we reached the final stile, and as we climbed onto the road I overtook them. It’s a great feeling to pass people you’ve been chasing, and one I never thought I’d feel. The last half mile is along the lanes back to the cricket club, and I even managed a sprint finish. Crossing the line in the rain, I grabbed a cake and a cup of water and chatted to a couple of other finishers. In the pouring rain. Runners are strange! I checked my time when I got home, and saw I’d completed the course in 1:17:36, about 3 minutes faster than last time. My ‘moving time’, as record by my Garmin, was 1:14:24. That was a lot of shuffling time at the start plus queuing at stiles! I set off for an easy 3 miles the other morning. The only question was how to make sure I really did take it easy. Well of course, the technological way to ensure you run ‘easy’ is to use a heart rate monitor. Simple, yes? Well, it is if you actually remember to wear your heart rate monitor. The non-technological way is to run ‘by feel’. This simply entails running so that it feels easy. If you have a running partner you can chat as you plod along, but as I usually run alone this would just be strange. I also tend to forget I’m meant to be going slowly as I get so wrapped up in my thoughts. So, I’ve developed a new way to “run easy”. It does take some specialist equipment, and can only be undertaken at this time of year, but it really works. 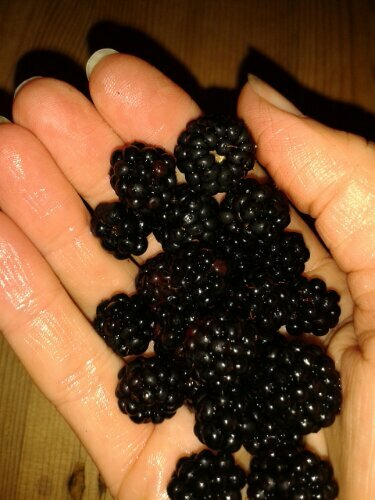 I give you, exhibit A.
I picked a handful of luscious blackberries on the homeward bound section of my run. Being greedy I filled my hand, and this meant I had to run very carefully (i.e. slowly) to avoid dropping any. Perfect! By Friday I pulled myself together and dragged myself out for a run again. It felt hard. It was an ‘Easy 3 miles’ and yet my Heart Rate was up and I coughed my way round. I gave myself the weekend off. On Monday I set off down the lane from my house that leads to a killer hill. The lane slopes gently for a mile, then plunges down to a brook. Coming back up It’s is a short, but steep hill (the road sign warns “25%”) and I’ve never managed to run all the way up it before. Technically I’m not sure it was running it was that slow, but I didn’t stop and I made it back up. I then added a loop up through a field to make it just over three miles. Wednesday I ran some intervals, and on Friday I added a Long Run. This week I attacked ‘The Hill’ again on Monday, sneaked in a Tuesday Tempo run, and eased in an Easy run on Wednesday. I am planning a Long Run for Friday. I entered a race. Not just any race, but an off road, multi-terrain race with a shocking hill in the middle, lots of mud, and last time even a field with a bull in. The Marshfield Mudlark. Apart from huge respect for the marshal who had to stand in the field with the bull, I also remember how much fun this race is and also how hard it is. I’ve run it in the rain (when they had to move the car parking off the cricket field because it was too wet) and I’ve run it in blazing sunshine (when I took my water bottle with me because I knew I woudn’t last between water stations without a drink). It was still muddy that year. 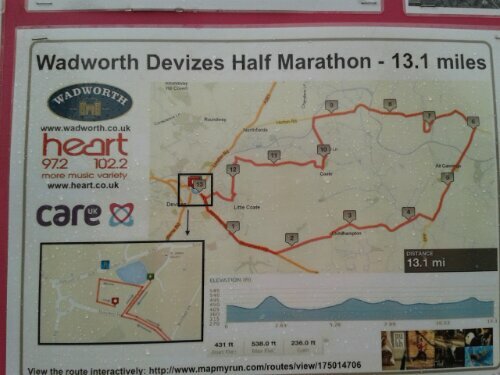 Oh and a week after that, I’m entering the Wadsworth Devizes Half Marathon. Well, its not far to travel, it’s sponsored by the local brewery and last year the goody bag contained an engraved pint glass. It’d be rude not to. Posted on 03/10/2013 03/01/2014 Categories Off RoadTags Entering Races, Marshfield Mudlark, Motivation, Wadsworth Devizes Half MarathonLeave a comment on Hello Motivation!